Brrrr....I'm so ready for some "fall foods" and the chill in the air is finally conducive to soup weather. This time of year I will make large pots of soup on the weekends and package it up for a grab and go lunch option during the week. 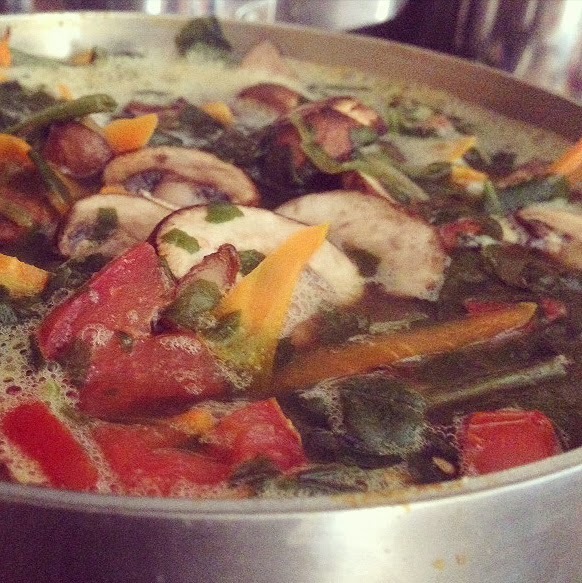 This particular soup is chuck full of spinach, carrots and sustainable white beans. But don't hesitate to switch them out for some of your favorites. That's the thing I like about soup you can change the recipe up in an instant just by adding different veggies. In a small saute pan heat oil over medium heat. Add mushrooms and cook until fork tender about 10 mins. Remove from pan and set aside. Do the same with the bell peppers. In the meantime bring stock to a boil in large pot. Add all of the vegetables and the beans and simmer about 20 mins. Season with salt and pepper to taste and serve.